Marina del Rey is an unincorporated seaside community in Los Angeles County, California, with a marina that is a major boating and water recreation destination of the greater Los Angeles area. The marina is North America's largest man-made small-craft harbor and is home to approximately 5,000 boats. The area is a popular tourism destination for water activities such as paddle board and kayak rentals, dining cruises, and yacht charters. This Westside locale is approximately 4 miles (6.4 km) south of Santa Monica, and 4 miles (6.4 km) north of Los Angeles International Airport. 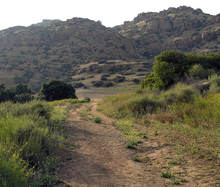 Surrounded entirely by urban development, the Verdugo Mountains represent an isolated wildlife island and are in large part under public ownership in the form of undeveloped parkland. The mountains are used primarily for recreation in the form of hiking and mountain biking, and as the site of communications installations on the highest peaks. Rancho Palos Verdes (also known by the abbreviation RPV) is a city in Los Angeles County, California atop the Palos Verdes Hills and bluffs of the Palos Verdes Peninsula. A suburb of Los Angeles, it is known for expensive homes amidst large tracts of open space with expansive views of the Pacific Ocean. Rancho Palos Verdes is translated as "Ranch of Green Sticks", probably referring to the willows in the northeastern part of Bixby Slough (now known as Machado Lake) shown on earlier maps. The history of Rancho Palos Verdes dates back to the Tongva or Gabrielino Indians, who inhabited the site before the Age of Discovery. Spanish explorer Juan Rodriguez Cabrillo was credited as the first European to navigate the California Coast in 1542, which included the hills of Rancho Palos Verdes. Rancho de los Palos Verdes was established by a Mexican land grant given in 1846 by Governor Pío Pico to Jose Loreto and Juan Capistrano Sepulveda. The Santa Ana River is the largest river entirely within Southern California in the United States. It rises in the San Bernardino Mountains and flows for most of its length through San Bernardino and Riverside Counties, before cutting through the northern Santa Ana Mountains via Santa Ana Canyon and flowing southwest through urban Orange County to drain into the Pacific Ocean. The Santa Ana River is 96 miles (154 km) long, and its drainage basin is 2,650 square miles (6,900 km2) in size. The Santa Ana drainage basin has a diversity of terrain, ranging from high peaks of inland mountains in the north and east, to the hot, dry interior and semi-desert basins of the Inland Empire, to the flat coastal plain of Orange County. Although it includes areas of alpine and highland forest, the majority of the watershed consists of arid desert and chaparral environments. Due to low regional rainfall, the river carries only a small flow except during the brief winter season, when it is prone to massive flash floods. The San Jacinto River, which drains the southern half of the watershed, rarely reaches the Santa Ana except in extremely wet years. However, a wide variety of animal and plant communities depend on the riparian zones and remnant wetlands along the Santa Ana River. central business district (CBD), Orange County has no single major downtown / CBD or dominant urban center. Santa Ana, Costa Mesa, and Irvine all have smaller high-rise CBDs, and other, older cities like Anaheim, Fullerton, Huntington Beach, and Orange have traditional American downtowns without high-rises. The county's northern and central portions are heavily urbanized and fairly dense, despite the prevalence of the single-family home as a dominant land use. Its southern portion is more suburban, with less density and limited urbanization. There are several "edge city"-style developments, such as Irvine Business Center, Newport Center, and South Coast Metro. Orange County is part of the "Tech Coast". The Victor Valley is a valley in the Mojave Desert and subregion of the Inland Empire, in San Bernardino County in Southern California. Looking west from Topanga Canyon Blvd. ... that Darnell Hunt, Dean of Social Sciences at UCLA, believes Hollywood should use the Rooney Rule to increase the share of African-American writers? ... that Nannie C. Dunsmoor, a Los Angeles pioneer woman physician practicing into her 80s, was the oldest United States active member of the Soroptimist Club? ... that all four Andretti Autosport entries at the 2017 Toyota Grand Prix of Long Beach retired from the race due to mechanical or electrical issues? ... that all five of the surviving members of the original cast of the Power Rangers series attended the film adaptation's Los Angeles premiere in March 2017? ... that Galco's Soda Pop Stop in Los Angeles carries more than 700 different soft drinks? ... that Don Ingalls first met Gene Roddenberry when they worked at the Los Angeles Police Department, and went on to be credited with writing two episodes of Star Trek? Do you have a question about Greater Los Angeles that you can't find the answer to?